How to combine INDEX, MATCH, and MATCH formulas in Excel as a lookup function. 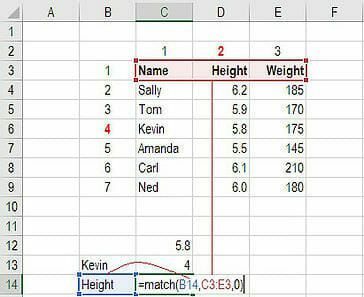 What is INDEX MATCH in Excel? 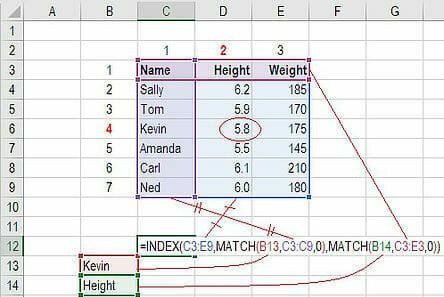 The INDEX MATCH MATCH formula is the combination of two functions in ExcelExcel ResourcesLearn Excel online with 100's of free Excel tutorials, resources, guides, cheat sheets, and more! CFI's Excel resources are the best way to learn Excel on your own terms. These guides and articles teach spreadsheet formulas, shortcuts, and functions step-by-step with screenshots, templates, lessons, guides, and more: INDEX and MATCH. =INDEX() returns the value of a cell in a table based on the column and row number. =MATCH() returns the position of a cell in a row or column. Combined, the two formulas can look up and return the value of a cell in a table based on vertical and horizontal criteria. For short, this is referred to as just the Index Match function. To see a video tutorial of Go To Special check out our free Excel Crash Course. Below is a table showing people’s name, height and weight. We want to use the INDEX formula to look up Kevin’s height… here is an example of how to do it. 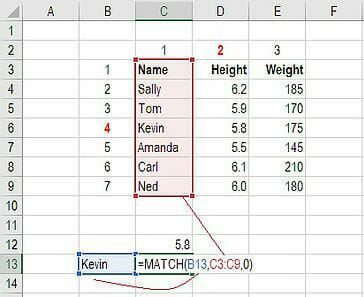 Sticking with the same example as above, let’s use MATCH to figure out what row Kevin is in. Use MATCH again to figure out what column Height is in. Now we can take the two MATCH formulas and use them to replace the “4” and the “2” in the original INDEX formula. The result is an INDEX MATCH MATCH formula. Congratulations, you now have a dynamic INDEX MATCH formula! 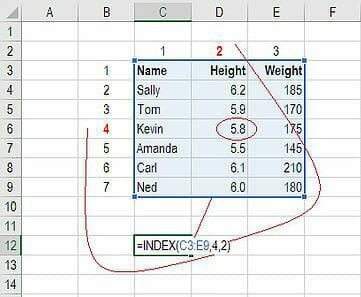 Below is a short video tutorial on how to combine the two functions and effectively use Index Match in Excel! Check out more free Excel tutorials on CFI’s YouTube Channel. Hopefully this short video made it even clearer how to use the two functions in order to dramatically improve your lookup capabilities in Excel. Go To SpecialGo To SpecialGo To Special in Excel is an important function for financial modeling spreadsheets. The F5 key opens Go To, select Special Shortcuts for Excel formulas, allowing you to quickly select all cells that meet certain criteria.